Improve customer service, reduce no-shows & handle cancellations. The next generation of appointment solutions. Low-cost, automated Voice & SMS solutions that improve your appointments process. 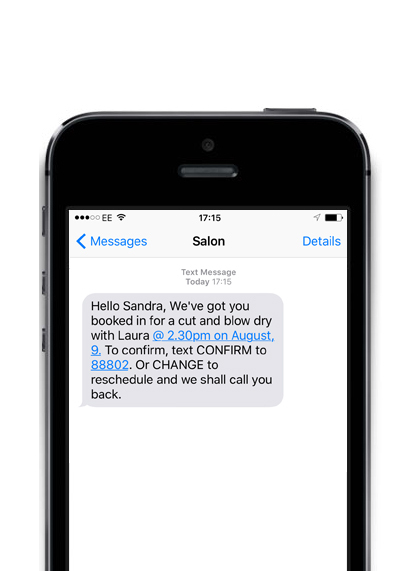 Send out automated SMS or Voice notifications using your customer or patient's preferred method of contact, once booking has been made through your existing booking system. Show that customer service matters by delivering their message instanty, when they need to know. More personal than traditional email and more flexible than a direct mailer using Voice makes it easy to send personalised reminders to customers on-the-go with the option to be transferred, and prioritised when appointments need to be rescheduled or booked. Due to the high read rate (98%) of SMS you can almost guarantee that your text message reminder for an appointment or booking will be read. Take customer service further by providing an option to cancel or rearrange using a shortcode, long number and keyword. Our SMS solution can pass data straight back to your booking sofware and our Voice solutions, straight over to a member of your team, or department by email or trigger within your API. This will enable you to confirm and fill last-minute appointments as soon as they become available following a cancellation. Reduce the impact of missed appointments. "No-shows" who miss a scheduled appointment or reservation are far more than an inconvenience, they can result in lost revenue, last-minute schedule changes and increased expenditure. Using SMS and Voice for appointment booking, re-scheduling and reminders can significantly impact the efficiency and profitability of your organisation making it simple for your customers or patients to effectively manage their time according to their contact preference and without a complex process. Automate the entire booking process without any additional staff requirement. The instant nature of a Voice Broadcast or text message are what make them so effective - reach people fast and allow to them respond just as quickly. Send a Voice Broadcast which can be transferred to a member of staff when an appointment needs rescheduling or automate a text message with the required details of their appointment so they have them to hand. Send a link to a booking portal and integrate with existing software. "32% of people would prefer to schedule or change appointments and confirm reservations by text message." 35% of salon clients want to schedule appointments during non-business hours. Missed GP appointments costs the taxpayer £162m while missed hospital appointments cost £750m.